Our Bodacious Dog Mom Life: Bodacious Easter Biscuit Love. Time. Well. Spent. Bodacious Easter Biscuit Love. Time. Well. Spent. 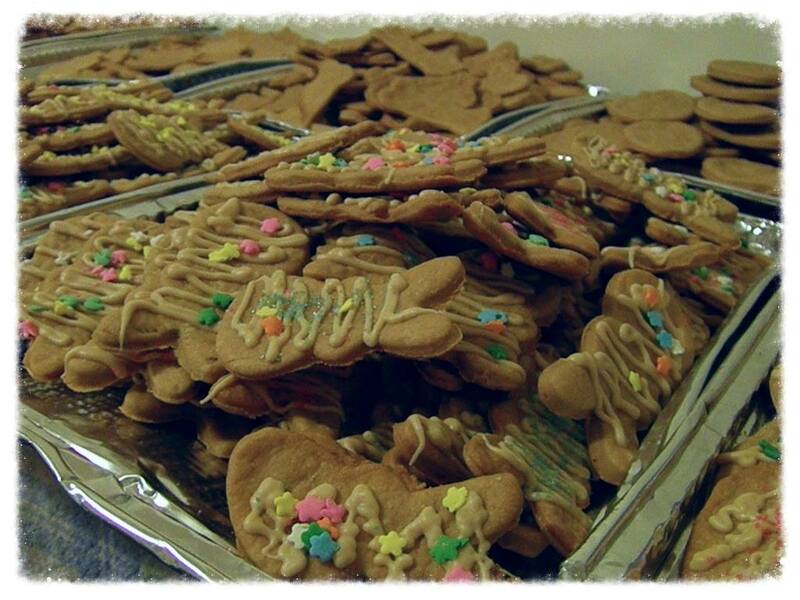 This is our third year baking Easter Biscuit Love for our local Connecticut animal shelters. It's a lot of work and usually involves 3-4 days of baking Easter and Spring shaped biscuits, 1 day of decorating some of the biscuits and 1 day of packaging, boxing and filling Easter baskets. On top of that, we spend most of the week delivering Bodacious Easter Baskets to local animal shelters that are close by. For the shelters further away, we ship. 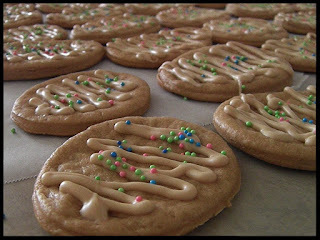 Early Friday morning, I started baking the biscuits for our Bodacious Easter Baskets. It's a slow process. We're only able to bake 1 cookie sheet at a time. That yields 1 1/2-2 bags of biscuits depending on size and shape. We've tried baking 2 cookie sheets at a time, but they ended up too well done on the bottom. Each cookie sheet requires 22 minutes in the oven. After baking for 3 days, we had enough biscuits. In addition to our biscuit table, we set up a card table to hold additional trays. Every tray was piled high with various Easter, spring and bone shaped biscuits. While the biscuits sat for 24 hours, as required, we made labels, put together some shipping boxes, scheduled delivery times and prepped our Easter baskets. This morning, the counters were taken up by our Easter egg shaped biscuits. These gems got a drizzle of our peanut butter white chip mixture and finished off with some festive sprinkles. By the time Lisa got home from work, I had a few boxes ready to ship and the first of our Bodacious Easter Biscuit Love ready for deliver. 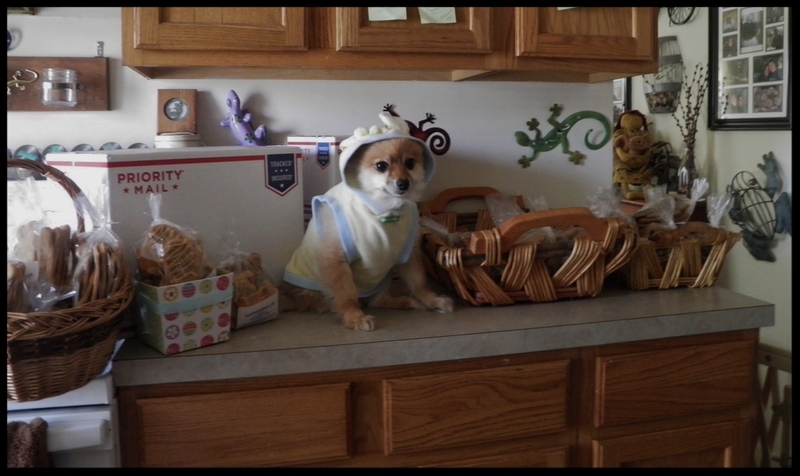 Lobo was dressed in his Easter bunny outfit and all set to accompany Lisa on her afternoon adventures. The Easter bunny costume didn't last long. By the time they reached the Ledyard Pound, he was ready to take it off. Weeks like this are beyond chaotic. On top of work, our daily routine, those unexpected things that throw my schedule to the wind and everything between, it's a lot. However, at the end of the week, after the last Bodacious Easter Basket is delivered and shipped, and we exhale, it's all worth it. 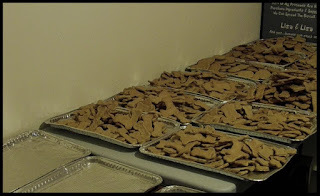 I couldn't imagine not making holiday biscuits for some of the shelter pups here in Connecticut. 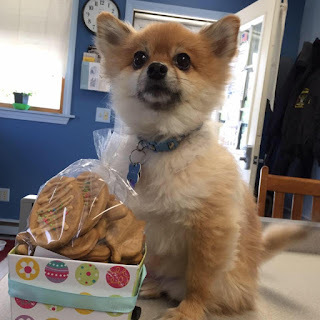 Whether it's for Christmas, Valentine's Day or Easter, the pups are grateful for the visits and their sweet treats.